Companies creating smart-meter solutions for the water industry face two big challenges: how to transmit meter data from homes to utilities, and how to help utilities crunch that enormous volume of data. Most utilities can’t afford to build private wireless networks or datacenters filled with servers and sophisticated analytical software. Transparent Technologies (T2) of Boulder, Colorado, overcame these obstacles by devising a smarter smart-meter solution. It teamed up with Verizon Wireless to use its existing cellular network and with Microsoft to use the Microsoft Azure cloud computing platform for meter data management and analysis. With these third-party providers, T2 eliminated the major capital outlays faced by water utilities in setting up smart-meter systems. About a year into developing its Virtual Network, T2 brought in Saviant Consulting, an India-based member of the Microsoft Partner Network with expertise in Azure, to help with the project. 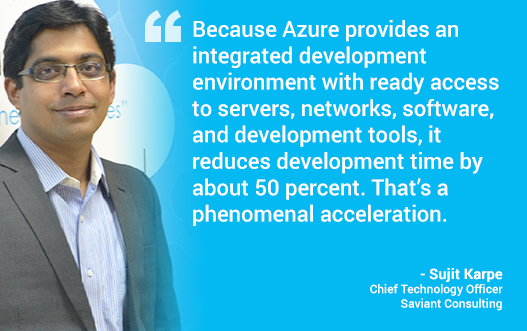 “Because Azure provides an integrated development environment with ready access to servers, networks, software, and development tools, it reduces development time by about 50 percent,” says Sujit Karpe, Chief Technology Officer at Saviant. “That’s a phenomenal acceleration.” Karpe also cites the interoperability of Azure services, which eliminates the need to build connections manually. Transparent Technologies and its development partner, Saviant Consulting, took advantage of nearly the entire portfolio of Microsoft Azure services, from platform as a service (PaaS) to infrastructure as a service (IaaS). T2 used Azure PaaS tools to obtain the servers, networks, and storage to develop its Virtual Network and Innov8 smart-meter register. The company’s T2 Virtual Network server, which was developed using Azure Cloud Services, serves as the communications front end that receives, validates, authenticates, and processes all incoming meter data.